Both beautiful and stunning, the Mercury Dime has been seen as one of the greatest US dimes that were ever produced. Made primarily out of silver, Mercury Dimes enjoy large demand from both collectors and investors. 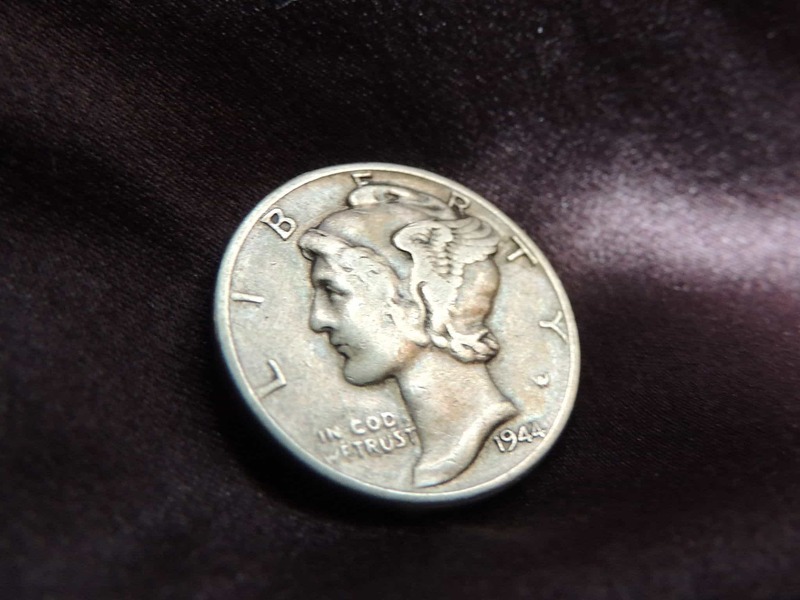 Designed in 1915 by Adolph Weinman, the Mercury Dime was set to replace the long-running Barber design. This decision was made by US Mint director Robert Woolley, who commissioned a competition to find the next design for America’s dime. Weinman not only won the competition for his dime design, he also won with his design for the half dollar. Weinman’s obverse design featured a bust of Lady Liberty wearing a cap with wings. The “LIBERTY” motto can be found above the bust and “IN GOD WE TRUST” graces the left of Liberty. The date of mintage can be found below the bust. Just to the right of the date, a “W” can be found and is Adolph Weinman’s initial. The reverse of the Mercury Dime is unique compared to other coins of the time. A fasces or hatchet surrounded by wooden rods is the prominent design. An olive branch is added to represent peace. “UNITED STATES OF AMERICA” can be found above the fasces. The denomination, “TEN CENTS,” is found centered below and “E PLURIBUS UNUM” is found in the right field. 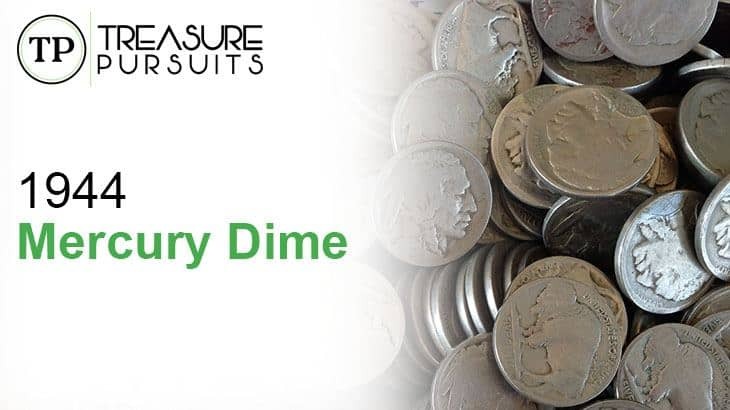 Want to know more about the Mercury Dime as well as other collectible US Dimes? Be sure to check out our Ultimate Guide to Collectible Dimes. The 1944 Mercury Dime is one of the more interesting dates in the Mercury Dime series. First, the Mint at Philadelphia says that 231,410,000 examples of the Mercury Dime were minted in 1944. This is by far the largest amount minted in the series and is due to the wartime economy. Money needed to be injected into the economy and the Mercury Dime was not the only coin to see a huge uptick in production. 1944 was a year that saw a decrease in strike quality, with few Mercury Dimes having full and strong strikes. This makes coins that feature full split bands on the fasces exceedingly rare. Like all other Mercury Dimes, the 1944 Mercury Dime features a composition made up of 90% silver and 10% copper. Physical properties included a weight of 2.50 grams and a diameter of 17.91mm. As discussed above, 1944 Mercury Dimes tend to have a much weaker strike than other dates in the series. Because of this weak strike, not many coins feature full separation of each band holding the wooden rods in the fasces. A fully struck Mercury Dime that features Full Bands will have all bands on the fasces fully visible and have a small line through the middle running horizontally. Any type of abrasion or nick that disrupts this small line on each band will not get a “Full Bands” designation. Most of the time, only 1944 Mercury Dimes that are in Uncirculated condition have a chance of displaying Full Bands. In conditions below Uncirculated condition, the chance that the bands have been worn due to circulation rises immensely. Due to their rarity, 1944 Mercury Dimes that display Full Bands are worth much more than similar grade coins. Only third party grading companies give the “Full Bands” designation. This requires a collector to send their coin in to get it certified if they want to claim this designation. The 1944 Mercury Dime sits on two extremes when it comes to the value of the coin. Most commonly, 1944 Mercury Dimes will fall into the lower end of the spectrum when it comes to pricing. Examples in Fine condition and below are only valued at the price of their silver content, around $1.50. Values rise only when the coin is in MS-60 condition, with examples retailing for $6. Still relatively affordable at $27, the MS-65 examples shows little appreciation in price over their MS-60 counterparts. 1944 Mercury Dimes that have gotten the “Full Bands” designation are far more valuable than non-designation coins. MS-65 coins with Full Bands are valued at $80, a huge increase over the $27 for a non-designation example. No examples have been graded lower than MS-60 while receiving a “Full Bands” designation, based on third party grader NCG’s database.